After the captured of Tabqa airbase in Syria by the Islamic State last week a number of photographs were posted online showing the weapons captured at the airbase. These included many weapons seen elsewhere in the conflict, from ZU-23-2 anti-aircraft cannons to Konkurs ATGMs. Today, a new video released by the Islamic State shows more of the airbase, and the equipment captured. Again, much of what is shown are weapons seen elsewhere in the conflict, but 6 minutes into the video something not yet seen in the conflict is shown. So without prior knowledge of what this item could be, how to we identify what it is? In this case we have quite a few clues clearly visible thanks to the markings on the case. First, we can see the word “panzerabwehr”, which we can quickly Google Translate to “anti-tank defense”. We can also see a measurement, 136mm, above that, and in this instance it’s actually possible to find an ID with just that information. If you Google both words, “panzerabwehr 136mm”, and check the image search results you’ll see the following images. sell this handy container of LFK HOT, ground target / anti-tank. Container is water-tight sealing, painted sheet steel, 136cm long and 25x25cm in cross section, about 15-20kg difficult. All ends and Did are Rubber armored. Sell only to Pick Up , shipping is too expensive !! If we Google “LFK HOT” the first result is the Wikipedia page for the HOT missile, a missile made jointly by the French and Germans that can be used by ground vehicles and aircraft, including French Gazelle helicopters sold to Syria in the 80s. 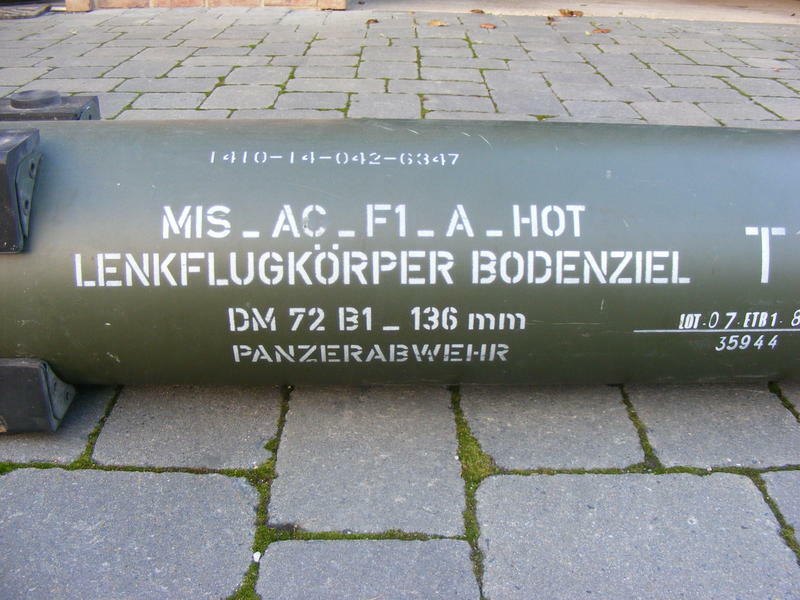 It’s actually possible to make out “HOT” on the top row of markings visible in the Islamic State video, and “Lenkflugkörper” (German for guided missile) is abbreviated to LFK. The next questions to investigate is whether or not the platforms for launching these missiles are at the airbase, and whether or not they are able to be launched from improvised launchers. Based on the Islamic States previous track record for publicising their activities, if the answer is yes to those questions it seems likely we’ll see that soon enough. Frank, we can’t know for certain if Syria ordered ATLAS launcher systems for them at some point. If so, ISIL could easily mount those on any technical. There is also the fact they can be manually fired unguided and used as “dumb” artillery. Such a tactic has been used successfully by Afgan mujaheddin against both Soviet and Coalition forces using a wide variety of man portable and vehicle mounted rocket systems. Qatar has an extensive inventory of HOT missiles. These look quite new and I would be serious surprised in the Germans have shipped any HOT missiles to Syria inside the last 20 years. Any information on when the last batch of HOT were sold to the SAA? Hi ello, looks like you have a copycat, haven’t seen any credits to you, pitty, like your analyses. Isn’t this the MILAN weapon (http://en.wikipedia.org/wiki/MILAN)? Anyway, the german MP Jan van Aken did some investigations on the use of german-french MILAN weapons. German media reported about that in January 2014 (e.g. linked here on van Aken’s website: http://www.jan-van-aken.de/aktuell.html?newid=385).